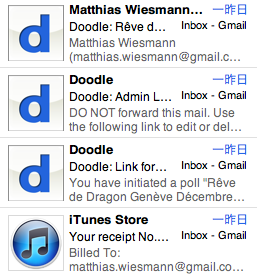 One feature of Mail.app on OS X that I like is that it shows the picture associated with the sender of an e-mail. The normal way of associating a picture with an e-mail is using the Address Book. While this makes sense for the humans I’m interacting with, I don’t want to add an address book entry for no-reply@flattr.com. The good news is, there is an old Next-Step era mechanism that still works, even under Mac OS X 10.7: just add a tiff file with a name e-mail.tiff into the folder ~/Library/Images/People, restart Mail.app and you are done. So for instance the Flattr logo goes into file ~/Library/Images/People/no-reply@flattr.com.tiff. If you want to reuse the icon of a desktop application, just open the application’s package (context menu) and go down into the Resources folder and open the Application-name.ics file with Preview.app copy paste the high-resolution icon into a new file and save it as tiff. While there is no way to have a file match multiple e-mail addresses, you can avoid duplicating files using symbolic or hard links. On the other hand, those images, contrary to the ones added in address book can contain an α-channel (transparency). This entry was posted in English, General, Macintosh and tagged Hint, OS X. @Ptniutz, tu es sous Lion? Does this still work in Mountain Lion for you? I have just upgraded and it does not appear to be working. It does still work under Mountain Lion. i managed to solve this by going into Mail preferences and under viewing select show contact photos.